After 3 years of speculation and various pictures of what the new Skyline might look like, the wait was over in 2001. 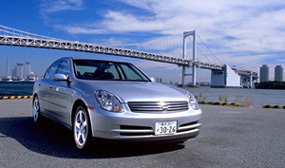 Rumors stating the Skyline would be dropped in favor of the new Z-Car proved not to be true, when on June 18th, 2001 the V35 Nissan Skyline was released. Introduced on June 15th, 2001, the V35 Nissan Skyline series marks a radical step away from previous Skylines with extensive changes in the design and engineering departments. The new car is available in four versions: 300 GT, 250 GT, 250 GT-Four, and 250 Gte, with the 250 GTe being the least expensive model and the 300GT marking the top of the line. All of them replace the previous RB-series inline-6 engines with V6's driving the rear-wheels and offer considerably more interior space. 250 GT-Four versions feature with all-wheel-drive.